If you haven’t heard of the name Latavia Coombs yet, you will. You know what? Before you read any further, follow these steps. Check out the Women’s All-College Outdoor Descending Order List. Scroll down to the triple jump. You didn’t have to look too far, did you? The All-College Descending Order List includes every program in the TFRRS database and ranks athletes based on their marks. That means athletes from NCAA Division I are billed against those from NCAA Division II, NCAA Division II, NJCAA Division I, NJCAA Division III, NAIA and finally, the NCCAA (National Christian College Athletic Association). Coombs, a sophomore at New Mexico Junior College, is 5th in the triple jump. She bounded a wind-legal 13.56m (44-6) at the Ross Black Open this past weekend, which smashed her prior – albeit windy – lifetime PR of 13.26m (43-6) by exactly one foot. Here is the current top-5 of the Women’s All-College Outdoor Descending Order List as it pertains to the triple jump. To put this in perspective, if Coombs recorded that mark at any of the 2016 NCAA Outdoor Track & Field Championships, she would have won the NCAA Division II and NCAA Division III event titles and placed 4th at the NCAA Division I meet in Eugene, Oregon. That’s why Coombs should be on your radar for the remainder of the year. If not, she’ll open a lot of eyes next year when she’s a member of the University of Kentucky track & field team. Coombs, a native of St. Catherine, Jamaica, is already a juggernaut at the JUCO level. Back in March at the 2017 NJCAA Indoor Track & Field Championships, Coombs scored 34 points by herself to lead the Thunderbirds to a national title. Coombs competed 10 times over the span of two days – five times in the pentathlon (in which she placed 2nd), twice in the 60 hurdles (2nd) and once in the triple jump (1st), long jump (3rd) and high jump (t-6th), respectively. Blackwill wasn’t the only coach impressed by Coombs’ performance. What did Coombs think? Was she exhausted after she wrapped up the open high jump, which proved to be her final event of the proceedings? Coombs will have her chance come May 18-20 at the 2017 NJCAA Division I Outdoor Track & Field Championships in Hutchinson, Kansas. Right now Coombs is qualified for six events – 100 hurdles, 400 hurdles, high jump, long jump, triple jump and heptathlon – but said she’d prefer to focus on three: 100 hurdles, long jump and triple jump. It just so happens those three events are the ones Floŕeal – or “Papa Flo,” as Coombs calls him – told her she’d specialize in when she arrives on campus. 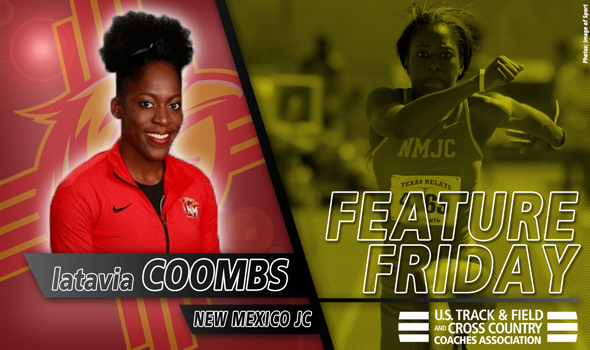 Then again, Coombs did whatever it took indoors for New Mexico Junior College to win the team title, so what would competing 14 times matter if it meant leading her team – the current No. 1 squad in the latest NJCAA DI Women’s Outdoor Track & Field National Team Computer Rankings – to the indoor-outdoor sweep?